To Cite: Vahedi L, Jabarpoor-Bonyadi M, Ghojazadeh M, Hazrati H, Rafeey M. Association Between Outcomes and Demographic Factors in an Azeri Turkish Population With Cystic Fibrosis: A Cross-Sectional Study in Iran From 2001 Through 2014, Iran Red Crescent Med J. 2016 ; 18(4):e29615. doi: 10.5812/ircmj.29615. Background: Outcomesforcystic fibrosis patients are improving rapidly. The demographic factors are notable variables inoutcomes, which can be evaluated and modified. Objectives: This study was designed to investigate the association between outcome and demographic factors in patients with cystic fibrosis. Patients and Methods: This was a cross-sectional study and data were gathered for 331 patients using the census method, from March 2001 to September 2014 in Iran. Data was analyzed using logistic regression analysis, chi-square test, and independent sample t test using SPSS 18. Odds ratio with confidence intervals of 95% and P < 0.05 were considered significant. Results: There were 85 (25.7%) deceased patients and 246 (74.3%) living patients at the time of the study. Of the 246 living CF patients, 202 (82.2%) were less than nine years of age, and 77 (90.6%) out of the 85 deceased CF patients had died younger than four years of age. There was a significant difference between outcome and location of residence. The risk of mortality was 50% less in urban patients than in rural patients (P = 0.03). The risk of mortality was approximately two times higher in patients with a positive family history than in those with a negative family history (P = 0.02). The proportion of mortality was approximately two times, or 94%, higher for those in a consanguineous marriage than for those in a non-consanguineous marriage (P = 0.01). Conclusions: The results demonstrated that the mortality rate was higher in CF patients with a positive family history, a consanguineous marriage, and residence in a rural area. Therefore, demographic factors play an important role in the outcome of cystic fibrosis. Unfortunately, these parameters, which can be managed easily and with low cost, have been overlooked. Cystic fibrosis (CF; OMIM 219700) is the most common lethal autosomal recessive disorder (1, 2), with an incidence rate of 1 in 2000 - 3000 live births in Europe and 1 in 10,000 births for Asians living in the United Kingdom (1). It is a multisystem disorder affecting the gastrointestinal, respiratory, hepatobiliary, and reproductive systems, as well as the sweat glands (1-6). CF is caused by a mutation in the cystictransmembrane conductance regulator (CFTR) gene, leading to defective ion transport of the CFTR protein (7-10). Although numerous mutations in the CFTR gene have been reported as a primary cause in the clinical manifestations and outcome of CF (9), recent research has focused on the role of other factors such as gender (11, 12), race (1), age (11), geographic area (2), infection with Pseudomonas aeruginosa (11, 13), religion (8), culture (1, 14), and nutritional status (13-15). Recently, improvement and progress in outcomes have been observed through better understanding of the disease, finding the effective factors in the start and progression of the disease, and ultimately in better management of the disease (16). These factors have led to earlier diagnosis and more timely treatment, which could affect the clinical course and change the outcome for a patient. Therefore, the link among researchers and clinicians will be stronger due to extensive research on the disease and improved introduction of the disease (17, 18). In addition, the research results could have an effective role in changing of the culture and laws of a society. Retrospective research, in spite of some disadvantages, plays an important role in depicting the disease (16, 19). Innovation and non-repetition of these studies are determinant factors for success. This research has been conducted after searching the electronic databases and performing a literature review, to ensure that no similar study had been undertaken in the region. This study established the role of demographic factors in outcomes. Ultimately, it could be effective in management of the disease by clinicians. This study aimed to assess the association between outcomes and demographic status in Azeri Turkish patients with cystic fibrosis. This was a cross sectional study conducted at the Educational and Treatment Children’s Hospital of the University of Medical Sciences and the Medical Genetic Laboratory, Tabriz, Iran, from March 2001 to September 2014. The Educational and Treatment Children’s Hospital is a governmental, specialized, and referral hospital with 150 beds and six wards in northwestern Iran and Dr. M. Rafeey is the top, and the most professional, physician in this field and region. Also, the Medical Genetic Laboratory is the first genetic laboratory in this region. This study was performed on Azeri Turks, who are members of one of the largest ethnic groups in Iran (20). Tabriz is the second largest city in Iran. All the medical records of the patients were reviewed using the census method, and further information was gathered from patients, or their parents, through telephone interviews. The diagnosis of CF was based on typical clinical features and confirmed by sweat chloride level > 60 mEq/L, according to the method of Gibson and Cooke, or detection of mutations in the CFTR gene known to cause CF (21). The medical records of 442 patients who met the inclusion criteria were separately reviewed by two authors. Patients with incomplete records and who were not diagnosed as having CF were excluded with the reviewer’s agreement. The Kappa agreement rate was higher than 85%, as inclusion criteria to the next phase. In the end, 331 cases were included in this study, which was conducted over a 13-year period from 2001 to 2014. All data were extracted utilizing the extraction table of Microsoft Office Excel software. Data included patient outcome, gender, age, residence, ranking in birth order of the family’s children, family history, consanguineous marriage, degree of consanguineous marriage, and weight at birth. The residential area was classified as urban or rural. Ranking in birth order of the family’s children was divided into two groups, including one child as the first group, and two children or more as the second group. A positive family history for CF was considered as having had a first, second, or third-degree relative affected with CF (22). A consanguineous marriage was defined as a union between two persons who are related as first cousins (3rd degree), first cousins once removed or double second cousins (4th degree), and second cousins (5th degree). The first degree and the second degree are forbidden for the Muslim population (23). In this study, first cousins were classified as the first group and the others as the second group. Demographic data were analyzed using SPSS 18 for means and standard deviations for normally distributed continuous variables, and median and interquartile ranges were obtained for non-normally distributed continuous variables. Frequency, percentage, and ratio were used for categorical variables. The comparison between variables was analyzed with a chi-square or Fisher’s exact test, and independent samples t test. Logistic regression analyses were carried out to identify variables independently associated with gender. In all analyses, the normalizing of the data distribution was evaluated using the Kolmogorov-Smirnov test. Non-parametric tests were applied for non-normally distributed data. Odds ratio (OR) with a 95% confidence interval, and P < 0.05 indicated statistical significance. Ethical aspects were considered and approval for the study was gained by the Ethics Committee of the university (No = 5/4/1775). Participants were assured of confidentiality, and consent was obtained from the patients or their parents. A total of 331 patients during the 13-year period were included in our analysis. Demographic data of this study is shown in Table 1.There was a significant difference between frequencies of deceased and living patients (P < 0.001). In the application of the Kolmogorov-Smirnov test, age was assumed as non-normal distribution that uses the sample median and the IQR (Minimum-Maximum), consequently, median age for living patients was 0.4 years (7 days–30 years) and median age at death was 4.8 years (3 months – 43 years). Abbreviations: D, days; IQR, Minimum-Maximum; M, months; Y, years.All data were mentioned as frequency (%). aAll data were mentioned as frequency (%). bFor deceased CF-patients, median age at death and living CF-patients, median age at time of the study have been considered, because of non-normal of age and weight at birth, median and IQR were applied. Age distribution differed between genders (Table 2 and Figure 1). Eighty-five patients expired during the 13 years of the study with a mean of six deaths per year and at a ratio of 1:3. During the time of the study, 77 (90.6%) of the 85 deceased CF patients had died under the age of four years. Among the 246 living CF patients, 131 (53.3%) were less than four years of age. At first, we calculated the association between outcome and gender. At the time of the study, 51 (26.7%) of the deceased patients were males and 34(24.3%) were females. The χ2 test did not show any significant difference between outcome and gender (OR = 1.13 [95% CI, 0.68 - 1.87], P = 0.6). In the next step, the association between the outcome and residence parameters was considered. There was a significant difference between the outcome and the geographic location (OR = 0.55 [95% CI, 0.32 - 0.95], P = 0.03). The risk of death was 50% higher in rural patients than in urban patients. There was no significant difference between outcome and ranking among the family’s children, while 38 (23.9%) were first-born children, and 47 (27.3%) were second or later born children (OR = 0.83 [95% CI, 0.50 - 1.37], P = 0.4). In this study, we analyzed family history status among these patients, and the risk of mortality was approximately two times higher in patients with a positive family history than in those with a negative family history (OR = 1.91 [95% CI, 1.09 - 3.36], P = 0.02). The variable of consanguineous marriages was reviewed. There was a statistically significant difference between the outcome and consanguineous marriage (OR = 1.94 [95% CI, 1.14 - 3.29], P = 0.01), but no significant difference in degree of positive consanguineous marriage (OR = 0.68 [95% CI, 0.34 - 1.37], P = 0.2). The risk of mortality was 1.94 times higher for patients in consanguineous marriages than for those in non-consanguineous marriages. Finally, weight at birth was computed and compared in CF patients, both deceased and living. There was no significant difference between the outcome and weight at birth (OR = 1 [95% CI, 1 - 1.001], P = 0.7) (Tables 1 and 3). A logistic regression model was developed to examine the independent factors associated with outcome. There was no statistically significant difference when logistic regression analysis was considered with the OR for all of the variables (P > 0.05). Associations between gender, ranking in birth order of the family’s children, degree of consanguineous marriage, and weight at birth were not significant in terms of outcome, and therefore, omitted from the final model. When residential area, family history, and consanguineous marriage were entered into the model, the difference associated with outcome and OR was somewhat reduced. Results of logistic regression analysis illustrated the adjusted OR for the final model and are shown in Table 3. Abbreviations: CI; confidence interval; OR; odds ratio. aVariables for deceased patients /living patients were considered. The association between non-genetic variables and mortality in individuals with CF has been established (2, 6). Despite improved management and increased awareness, outcome remains an important issue for CF patients, because non-genetic parameters, especially demographic factors, have been ignored by researchers and clinicians. The current study was performed to highlight the associations between demographic parameters and outcomes in CF patients. In this study, the ratio of deceased patients to living patients was 1:3, with a significant difference. Eighty-five patients expired during the period of 13 years, with a mean of six deaths per year. In a study performed by Dodge et al. in the UK from 1996 to 2003, there were 1,066 deaths, with a mean of 133 deaths per year (15). Therefore, based on these findings the mortality rate is lower in our study than in the UK, perhaps because this study has been performed on an ethnic group in Iran with a low incidence of CF. In addition, it is likely that a number of deaths were not recorded or were not reported by the family in our study. In a previous study in Sweden, Lannefors et al. reported data from 1971 - 1999 showing that while the incidence of CF was 1/5600 live-births, the mean and median age of living CF patients were 18 ± 12 and 16 years, respectively. In this study, regarding deceased patients, 45% were older than 18 years and 10% were older than 35 years. 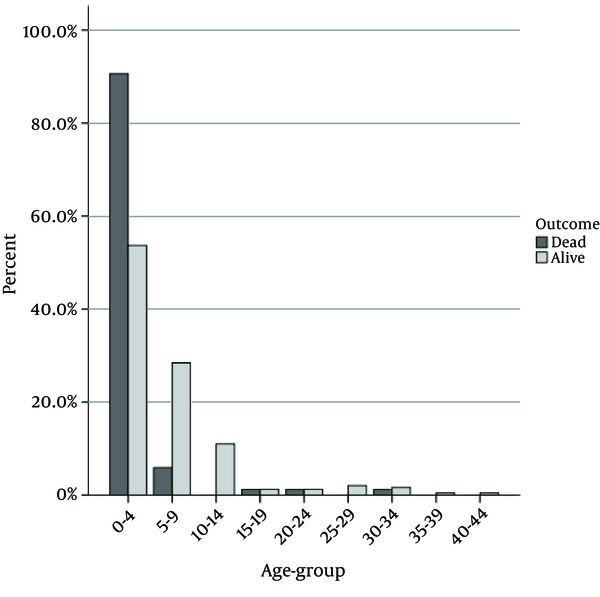 In deceased patients, the median age at death was 26 years (range 0 - 72) (2). In another study, the median age in non-EU countries was younger than in EU countries. Also, this statistic had been observed in median age at death. Delayed diagnosis and inappropriate health care were risk factors for a younger median age at death in non-European countries (24). In our study, living CF patients had lower mean, median, and were of an older age than that reported in developed countries. Also, in deceased CF patients the mean and median age at death were lower than in developed countries. We hypothesize that this difference may be due to the lack of proper equipment, inadequate diagnostic processes, and absence of treatment by specialists and expert staff, as well as poor nutritional status in our region compared to developed countries (13, 24). In our study, there was no significant difference between outcome and gender; however, the mortality rate was somewhat higher in males than females. A number of studies have indicated that males have a better survival rate than females, while Lannefors et al. (2) and Dodge et al. (15) showed 45% and 49% of males with CF expired, respectively. In another study, accumulated data related to the mortality rate between genders reflects a higher mortality rate in CF females compared to males (6). Cultural issues and intrinsic ethnic differences (1), as well as religion (8, 25) and geographical elements, (9) may be reasons for the differences. For example, females are more susceptible to CF because of their body functions; consequently, they more often report problems than males. Expression of problems can be observed more in females than males in our region because of cultural issues (26). Reasons for this difference may be unclear, so it is necessary to perform additional investigations in a large population from neighboring countries to elucidate this issue. In the current study, there was a significant difference between outcome and location of residence. The mortality rate of CF was 50% higher in rural patients than urban patients, in spite of less air pollution (10), lower stress, sufficient exercise, and organic nutritional intake in rural areas (13, 27). The availability of appropriate facilities to diagnosis and treat the disease is an important factor in patient survival. Growth and lung health of children is influenced by proper treatment, and decreased pulmonary function is associated with morbidity and shortened survival for CF patients (28). Continuous care, suitable food, and daily physiotherapy are the main elements in survival of CF (27). The relationship between improved nutritional support and increased survival in CF has been established, and retention of balanced and stable nutritional status is the best method of treatment for CF (13, 27). Preventive treatments, such as adequate exercise, have been introduced at early ages for CF patients, and it appears to be an important factor in health maintenance in patients with CF (27). In addition, a healthy lifestyle (27), related to appropriate family functioning (29), elevated levels of social class, education, and higher income (19, 30) are determinates of survival for CF patients. Patients living in urban areas are usually more likely to benefit from these conditions. In this study, there was no significant difference between outcome and ranking in birth order of the family’s children, although the mortality rate was slightly higher for the second or subsequent children than for the first-born. Management of patients with CF is one of the greatest challenges for families, and the family plays an important role in the treatment of CF (30). CF patients need constant care such as physiotherapy, various medications, proper dietary intake, exercise, and adequate support (21, 31). On the other hand, high socioeconomic status with adequate income, suitable occupation, and employment status were identified as factors related to a good prognosis in affected individuals (30). In crowded families, the difficulties in managing many children may affect the care of a CF patient. Patients with a positive family history, such as a diagnostic category (32, 33), had a higher mortality rate than those with a negative family history. There was a significant difference, with the risk of mortality approximately two times, or 91%, higher with a positive family history than a negative family history, in the current study. Ormond et al. published findings of a study stating that individuals affected by CF are segregated into four categories based on severity of disease. Patients with a family history of CF showed a broader range of superficial severity with an unknown reason (34).Understanding the reasons these patients have poorer prognoses than others will need additional research. Considering consanguineous marriage as a predicating factor of outcome, children born to related parents were 94% more at risk for death than children of non-consanguineous marriage, especially in consanguineous marriage of the first-cousin type (3rd-degree). Social conditions, religion, economic situations, and traditional beliefs are essential considerations in the preference for consanguineous marriage. In Muslim populations, first-cousin unions (3rd-degree) between a man and his father’s or mother’s brother’s daughter, and the opposite, were detected frequently. The incidence of consanguinity has been reported to be 56% in Middle East with Saudi Arabia having the highest prevalence at 89% in families with CF (35). Most studies have shown that early mortality is higher in the progeny of consanguineous unions than in non-consanguineous marriage (36). Ultimately, weight at birth was reviewed in deceased patients and living patients and no significant difference between them was found. The mean of weight at birth in the living CF population was slightly higher than the deceased CF population. CF is an autosomal recessive disorder affecting several organs, such as the digestive system, which is manifested in fat malabsorption, steatorrhea, and poor growth (2, 21). Lung function in CF patients is associated with nutritional status and body weight. Patients who intake adequate dietary requirements and gain proper weight have better pulmonary function (1, 13). An increased rate of mortality was associated with malnutrition, growth retardation, and declining lung function (1, 13, 37). It is thought that in consanguineous marriage this was observed and that low weight at birth in CF patients causes shortened survival. The risk of mortality increases with the number of demographic parameters. The presence of ranking among the family’s children, degree of consanguineous marriage, and weight at birth do not rule in the mortality of CF, although location of residence, family history, and consanguineous marriage are predictors of increased mortality in CF patients. The primary weakness of this study was that it was a retrospective study and may have limited accuracy, but it does lead the way to prospective research. Another weak point was the investigation was limited to a specialist group, which decreases the ability to generalize the study results. Data were limited to the Children’s Hospital of the University of Medical Sciences and Medical Genetic Laboratory in Tabriz, and it was possible that some CF patients were not referred to these centers. Also, the study was limited to the period of 2001 - 2014. The strength of this study was the adequate sample size in this population, and that it was conducted over a long period of time. Data that was approved by two reviewers were collected from educational, referral, and therapeutic centers, and were designed to evaluate the effects of non-genetic factors on outcomes. This study was conducted in a population with a unique religion, ethnic origin, and culture, which could be a basis for the performance of comparative studies. This study indicates an association between outcome and the number of demographic factors in CF patients and emphasized the role of these factors in outcomes. Clinicians need to be aware and educate patients and their families about treatments such as the correct use of medicines (oral nutritional supplements, antibiotics, and nebulizers), physiotherapy, and proper nutrition, which are essential for a positive prognosis, especially in patients living in rural areas. It should be required that the government and relevant organizations focus on informing the public of the dangers of consanguinity. Couples with consanguineous marriages, especially with a positive family history of the disease, require more frequent and thorough evaluations before pregnancy. Finally, it is recommended that these associations further investigated. Other studies were performed for evaluating the association, if any, between outcome and other demographic factors. We would like to thank the patients and their families, at the Liver and Gastrointestinal Disease Research Center, Children’s Hospital of the University of Medical Sciences, Tabriz/Iran. Authors’ Contribution: Leila Vahedi, Morteza Jabarpoor-Bonyadi, Morteza Ghojazadeh, Hakimeh Hazrati and Mandana Rafeey cooperated in design, conduction, data gathering, data analysis, and writing the manuscript. Funding/Support: This study, No. 5/4/1775, was an approved proposal at the Tabriz University of Medical Sciences and conducted at Liver and Gastrointestinal Disease Research Centre.